1.) Preheat oven to 400 degrees. Heat a large nonstick skillet over medium heat. Add ground beef, onion, jalapeno, and salt; cool mixture 8 to 10 minutes, breaking meat into small crumbles as you stir. Remove from skillet with slotted spoon; pour off remaining liquid. 2.) Lightly brush each tortilla with a bit of oil, then place on an ungreased cookie sheet and bake for three minutes. 3.) Remove tortillas from oven. Spoon beef mixture evenly over them. 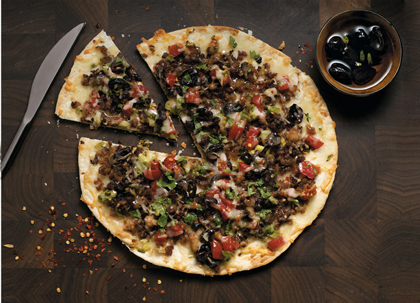 Top with tomato, green onion, olives, cilantro, and cheese. Bake 10 to 12 minutes, or until tortillas are lightly browned and cheese has melted. From pizza and casseroles to mac and cheese, the problem with most baked entrees is the creamy, cheesy sauces they’re cooked with. To make your dishes leaner, try cutting back on the dairy and amping up the amounts of peppers, onions, and herbs you use. An added benefit: Fiery spices also speed up your metabolism, fight inflammation in the body, and help you to eat slower so you fill up faster.